Alberni Valley Employment Centre is owned and operated by Island Work Transitions Inc. (IWT), and has been delivering employment services funded by the Government of Canada and Province of British Columbia since 2007. IWT operates a full-time office in Port Alberni and two part-time offices in Ucluelet and Tofino, providing free assistance and support to job-seekers in the Alberni-Clayoquot region of Vancouver Island, BC. Services to other communities in the region (such as Bamfield and Ahousaht) are provided through a combination of virtual and outreach delivery modes. Everyone is welcome to use AVEC's Resource Centres, which are fully staffed and equipped to provide access to self serve resources, including current employment opportunities, labour market information, and the use of computers, fax machines, photocopiers and telephones for job search and related activities. Employment Counsellors are available to help unemployed clients make career decisions, conduct a successful job search, or apply to participate in government funded services, based on eligibility. These services include group workshops, training supports, skills assessments, wage subsidy, self-employment services, and customized job placement. Employers too, are welcome to take advantage of available employer resources to help you find and keep the workforce you need. IWT delivers employment services in partnership with Central Vancouver Island Job Opportunities Building Society (CVIJOBS), INEO Employment Services, and Amber Education Services. Please visit our Contact page for information on hours and locations. 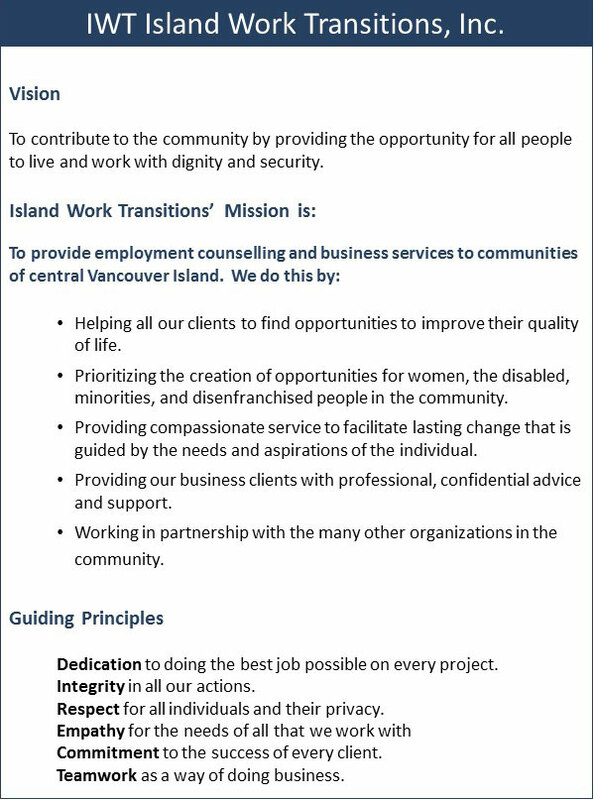 The Alberni Valley Employment Centre is managed by Island Work Transitions, Inc. (IWT). We are a certified Safe Harbour Affiliate, committed to building awareness and increasing understanding of diversity and inclusion in our own workplace, and in the community.